A massive hauling and towing capabilities are the priorities of the heavy-duty trucks but the modern versions fit also in modern standards regarding interior comfort and design while also come equipped with the top-notch tech features. In terms of functionality, the heavy-duty duo of GMC Sierra models is identical to the equivalents from Chevy’s courtyard but the styling and interior design are what makes the difference. 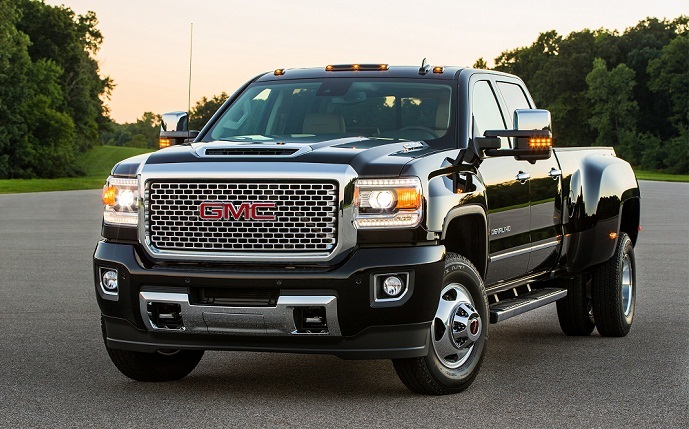 In that context, the GMC HD models are somewhat more stylish and available in a huge number of configurations. The new version of these trucks will be 2018 GMC Sierra 2500/3500 HD and they will come with a limited number of changes. According to what we know so far, GMC HD models will wait another model year for the more significant changes. After the diesel engine upgrades for the 2017 model year these trucks could bring some features upgrades combined with some new exterior and interior details. New color options, wheel design and exterior theme are also the things which could bring the refreshment to the lineup. The styling might be the reason why you would pick the 2018 GMC Sierra 2500/3500 HD models instead of the Chevy’s siblings or even recently redesigned Ford Super- Duty models. In some versions, GMC HD models will look very flashy thanks to the abundant use of chrome but GMC’s signature elements will also make them easily recognizable and appealing. The body sculpting will also be intensive with attractive bulges on the hood and GMC’s familiar squared-off fender flares. However, different grille designs, the range of wheel options and trim-specific inserts will make the distinction between each trim. For the 2018 model year, GMC might add new color options and wheel designs but new special edition version is also the possibility. Interiors of the Sierra heavy-duty trucks will, like in rival models, adopt the similar design as brand’s light-duty version. So, these trucks will be somewhat more stylish inside than other HD models and will also allow a high level of customization. The cabins will also be well isolated from the outer noise and you will find number of useful storage compartments as well. Well-sized controls and responsive IntelliLink infotainment interface will also make things easier. The models will also have supportive seats and an enormous number of available features. The body styles will include three cab versions and long 8 feet and short 6.5 feet cargo beds. Four trim levels will also be available including the base, SLE, SLT and top-of-the-line Denali. The Sierra 3500HD will come with the dual rear wheel setup as an option. The base models will get cloth or vinyl upholstery, 17-inch wheels, a 7-inch touchscreen option, six-speakers, etc. Upgrading to the SLE trim will mean 18-inch alloys, an 8-inch screen, carpeting, keyless entry, etc. The leather upholstery, power pedals, more chrome inserts, power and heated front seats, memory setting and more will be available in the SLT version. The Denali will boast the signature grille, chrome side steps, 20-inch alloys, driver information display, upgraded upholstery, etc. The models will also offer the Z71 off-road package and an array of active safety features. On the performance front, the 2018 GMC Sierra 2500/3500 HD will rely on the familiar engine options. The standard on all Sierra HD models will be a 6.0-liter V-8 gasoline engine. This power mill can produce 360 hp and torque of 380 lb-ft in its current version. The latest reports don’t promise power upgrade for this engine and it will again come in the combination with the six-speed automatic transmission. However, most buyers won’t likely regret additional cost for the recently redesigned turbodiesel engine. A 6.6-liter Duramax turbodiesel engine will produce the class-leading 445 hp and torque of 910 lb-ft. This engine will send power via the special 6-speed auto transmission. All Sierra HD models will be available with either rear- or all-wheel drive. They will also feature a typical suspension setup for the large trucks. Up front will be independent setup and leaf-spring configuration rear. The 2018 GMC Sierra 2500/3500 HD truck will likely arrive late this year or early next year. The price for the base models will be from around $35, 000.